There is "no link" between the shooting and allegations about a child being "led away", police say. "There is no connection to the latest incident," police said. Papua New Guinea police have rubbished immigration minister Peter Dutton's claims that last Friday's shooting on Manus Island was sparked by a young boy being "led away" by asylum seekers, saying there was "no link" between the two incidents. Dutton finally spoke about the Good Friday incident, where more than 100 bullets were sprayed into the regional processing centre by "drunken" navy officers, in a Sky News interview on Thursday. While PNG police and military had blamed the incident on a dispute about a soccer oval, Dutton aired previously unheard allegations relating to a young boy. "There was an alleged incident where three asylum seekers were alleged to be leading a local five-year-old boy back toward the facility," he told Sky News. "There was concern about why the boy was being led, for what purpose he was being led away back into the regional processing centre. I think it's fair to say the mood had elevated quite quickly. I think some of the local residents were quite angry about this particular incident and another alleged sexual assault." However, PNG police told The Huffington Post Australia on Friday that Dutton had gotten several key details wrong. They confirmed a young local boy had been near the centre recently, but that this occurred around a week before the shooting; that the boy had approached the centre asking for food, and was not "led" there; that there was no claims of any sexual abuse, and that the boy's parents had made no formal complaint to police; that the boy was 10 years old, not five; and that police were not investigating any link between this incident and the shooting. "I was informed a 10-year-old boy went to the centre and was given fruit," said senior inspector David Yapu. "Wilson Security intervened and took the child from the centre. Any claim of sexual abuse, there should be a formal complaint. Nothing has been reported to police. There is no connection to the latest incident [the Good Friday shooting]." "It is not related. There is no link at all." Fairfax Media has also reported that PNG police were not aware of any links between the two incidents. Yapu's account backs up claims from asylum seekers on Manus who say the boy approached the centre on his own, asking for food, and was given fruit. Yapu told Fairfax last week, before the shooting: "As far as I'm concerned, the movement of the asylum seekers within the town is quiet and peaceful and mixing with the local community. We are not getting reports of them being involved in illegal activities." Dutton said in his Sky interview: "I don't have the full details and those matters are under investigation." HuffPost Australia has contacted Dutton's office for a response to Yapu's comments, and for clarification of the incident he described on Thursday. On Thursday, Refugee Action Coalition spokesperson Ian Rintoul told HuffPost Australia "there's no foundation" for Dutton's "absurd" comments. "There's no foundation for that comment, it's absurd to suggest that any incident like that happened," he said. "The idea that a five-year-old, or anybody, could be led from a soccer field up the hill to the detention centre unimpeded, let alone the idea that they could get through the locked gates of the centre, is simply beyond belief." 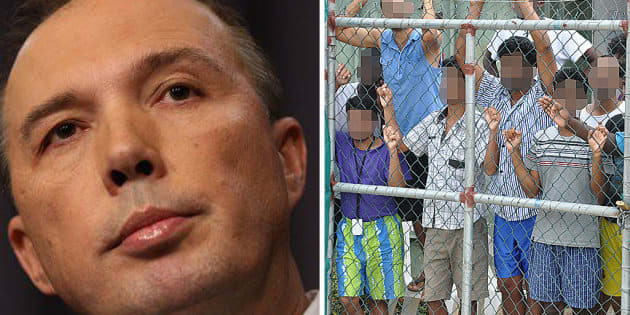 Iranian asylum seeker and journalist, Behrouz Boochani, said Dutton's comments were "dangerous" for relations on Manus between locals and asylum seekers. "The main issue is that the navy shot the refugees' rooms and staff offices. His comment is very dangerous and makes this place more unsafe because he is going to make more conflict between refugees and local people," he told HuffPost Australia.